Swap-A-Hunt Use this Forum to swap hunts with people from around the world. All private land and WILD birds behind shorthair pointer dogs. Bird #s are coming back. Would like to swap for SW USA hunt for Gambel's , Mearns, and California quail. Would also like to harvest Gould's turkey as well. I have all hunting land lined up and lodging for you and hunting dogs. 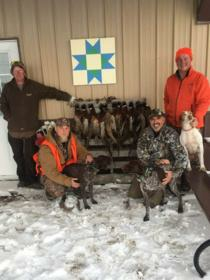 I am avid upland bird hunter wanting to get my dogs on some different birds. Let me know what you've got.